An exciting new development in the Falcon Lake area! Swimming, golfing, horseback riding, fishing, hunting, hiking, biking, skiing, snowboarding, snowmobiling, water sports, ATV riding and so much more! Located on Highway #1 just 8 miles west of Falcon Lake and only a few miles from the Whiteshell Provincial Park. Falcon West Estates offers a wide array of amenities at an affordable price. 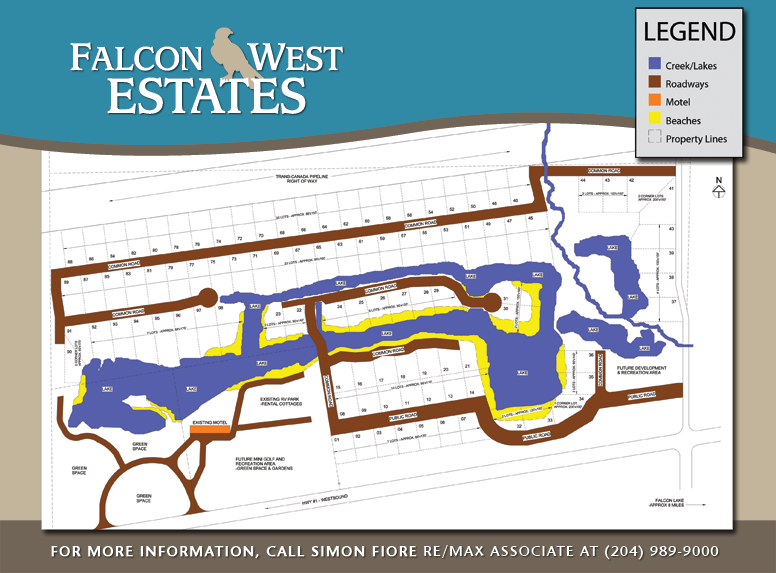 Falcon West Estates has it all, from a leasehold Park Model RV sites to cottage lots. Imagine yourself nestled in the tress which surround the private man made lake. Enjoy a wide variety of landscapes from lake front, beach side to wooded forest. We have something to appeal to the most discriminating cottager and budget. Enjoy the private lakes, sandy beaches, green spaces, forests, trails, wildlife, birds and all that nature has to offer right outside your door.